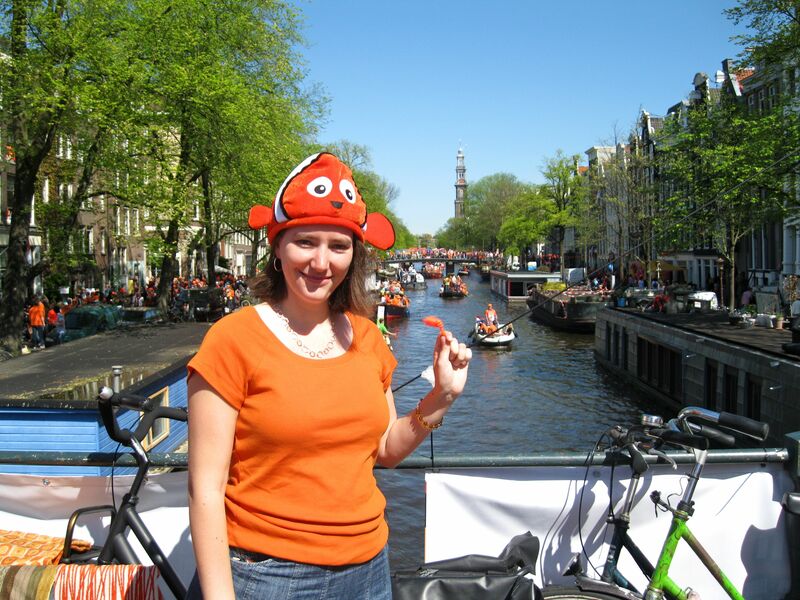 Dutch Queen’s Day! | Where is Yvette? The Dutch are not, as a rule, a particularly patriotic people- no one bothers to fly a flag unless it’s one of a handful of days even on official government buildings, and in fact it turns out when I wanted to buy a Dutch flag it took me several stores to fulfill this quest and even then I only found one in a tourist shop. 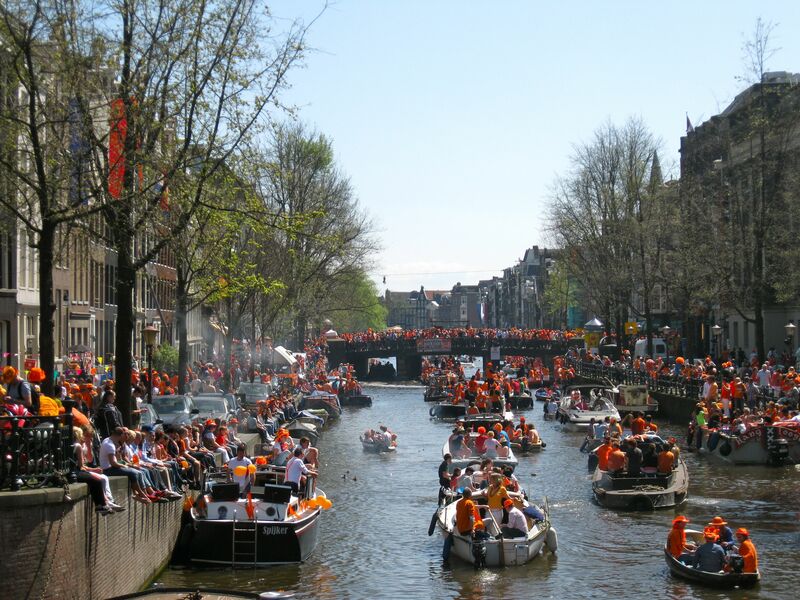 The exception to all of this though is every year on April 30, when the country catches oranjegekoorts, orange fever, and goes crazy in a giant street party to celebrate the Queen’s birthday in an event known as Queen’s Day (Koninginnedag– rolls right off the tongue doesn’t it?). If you don’t believe me on the pact part, the weather this spring has been bad even for Dutch standards- constantly around 15C (60F) degrees max, and cloudy with patches of rain- yet on the night before the sky abruptly cleared and we were treated to temperatures that wouldn’t have been out of place in July. Then the next day it was cloudy and crappy again. Now because it’s an experiment in free-market capitalism most things that are being sold are utter crap by people trying to make a bit of money on stuff they don’t really want to have anyway. Everyone parts with a few Euro anyway, though, either to the cute kids in the Vondelpark children’s market or in a drunken misconception that a Vertical Limit VHS tape is awesome and you just have to have it! Not one to pass up such a business opportunity, my brother decided to test out his salesman skills and bought a shopping cart full of beer to sell to the various passerby in front of my apartment. (Note: alcohol is one of the few things you’re not supposed to sell on Queen’s Day as you still need a permit to do so, but in practice several policemen walked by while we were selling it and never said a thing.) Because my apartment is on the first floor this involved selling beer from a bucket tied to a rope, where the beer was placed in the bucket once the money was handed over. We didn’t start until later in the afternoon as we spent the earlier hours exploring the revelry in the city, but soon after we started we had quite the steady stream of customers. For those curious, in the end we netted 100 Euro, 2 muffins, two packs of Smarties, a bowl of popcorn, one egg, and one bread roll. (Some of those random ones were bartered for beer, but a lot were from a little girl next door who became excited to discover we’d put candy in the bucket in exchange for boring things she found in the kitchen. What a deal!) 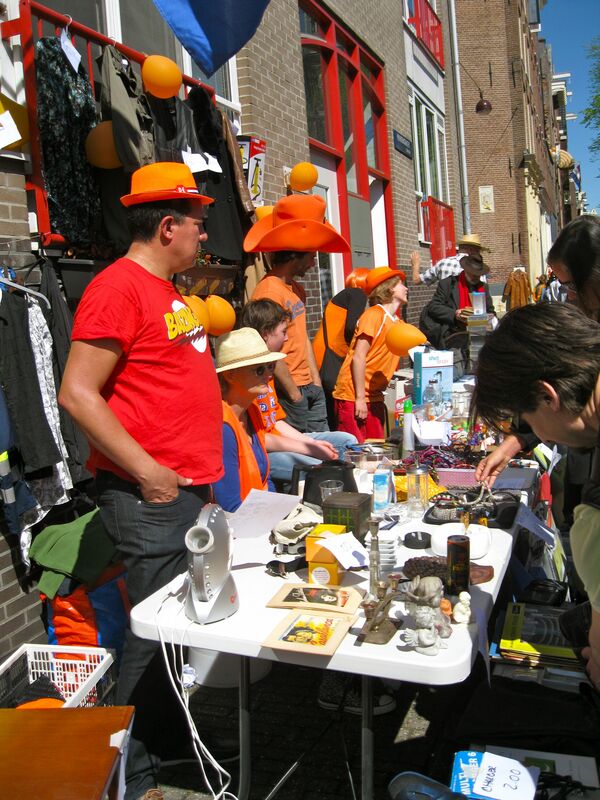 So all in all we did quite well for our first try on the vrijmarkt, and felt very proud and Dutch about our accomplishment. The next day, of course, we woke up to drizzle, the city looked like some sort of apocalypse had swept through, and the entire nation was suffering through what is known to many as National Hangover Day. 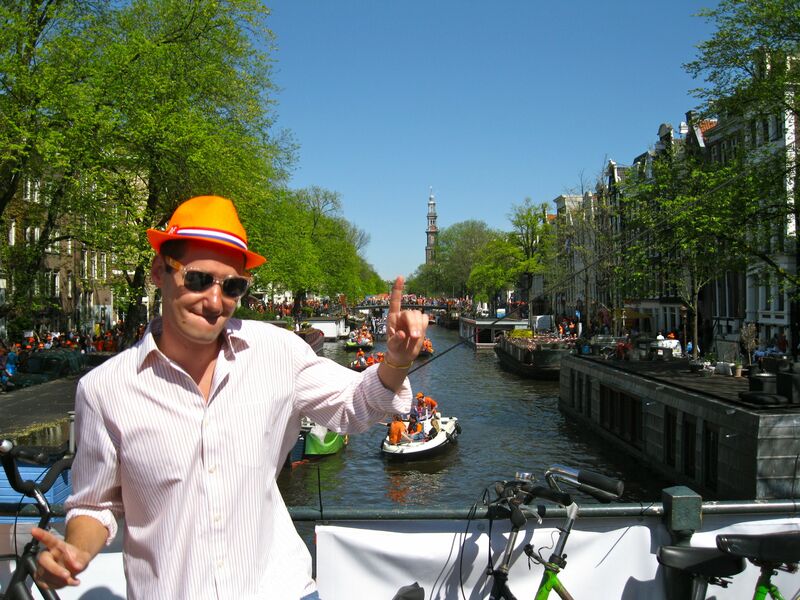 But all in all Queen’s Day was seriously a lot of fun, and I know I’m looking forward to next year! This entry was posted in 0. The Netherlands, Amsterdam, Dutch traditions. Bookmark the permalink. Googling for visitor blogs about new zealand, I stumbled across your weblog. As a native Dutchy, it is really nice to read about your experiences with the best day you could ever spend in the netherlands 🙂 I enjoyed your story very much, thanx! Pingback: Aan de Amsterdamse Grachten… | Where is Yvette? Pingback: I Went to Stockholm… | Where is Yvette?